OLD PARKED CARS. 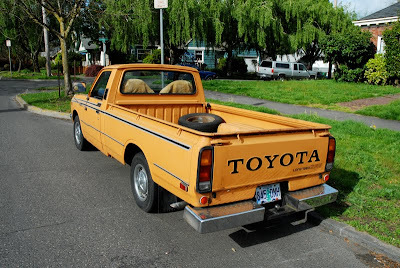 : 1977 Toyota Hilux SR5 Longbed. 1977 Toyota Hilux SR5 Longbed. I've never owned a truck, but I think this is simply stunning from every angle. It's one of those colors that was so perfectly matched to the body for the era, it will never NOT look good. I'm pretty sure I'll own one of these not too long down the road. great shots, man oh man, is this thing as cherry as it appears? spare in the back is a great detail, especially if it has some kind of clip or mount to secure it. what's going on with the hubcaps? Tony, do you mean what's going on with the sweet original hubcaps? At least, I think they are. Would you prefer any other look? Hey, thanks for putting my truck on your sight. you should see it now, bight orange with purple/yellow graphucs and toyota on gate in purple /yellow graphis. Deeple old style chrome wheels. It's a beauty. and yes those were original hubcaps. 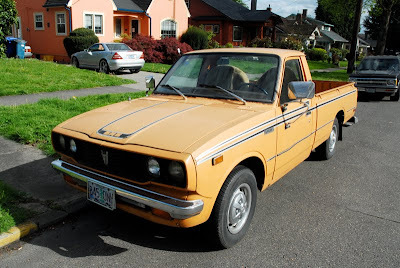 My stepdad had a 1977-78 Toyota Hilux pickup truck. It looked just like this truck, except for the bed of the truck was standard length rather than a long bed. I loved driving the truck. I miss driving the truck. What I like the most is its simplicity compared to today's trucks. It had a small, but capable 2.2 litre 20R four cylinder engine. Was it fast? Not very. I was able to accelerate from naught to 60mph in 15 - 20 secs. In its favour, however, was its low end torque. It delivered 96 hp (72 kW) @ 4800 rpm and 120 lbs-ft (162 N-m) of torque at just 2800 rpm. 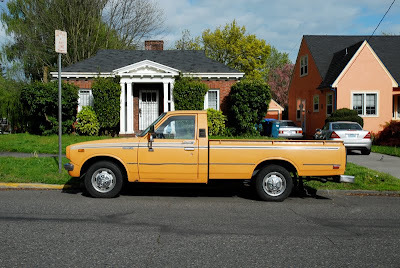 I had a '78, same color, that was a great truck, I used to haul my dirt bikes in the back of it, plus camping gear.